To Have and Have Not was one of the films selected by John Alvin for his romantic pairings series. 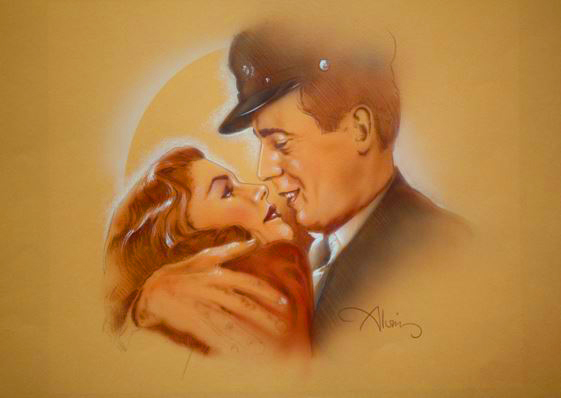 These gorgeous sepia-toned drawings emanate a romantic quality further enhanced by John's unmistakable aesthetic (coined by insiders at Disney as "Alvin-izing"). John Alvin actually named this piece, and was proud to compare this life long romance with his own. John Alvin, whose artwork is skyrocketing in popularity and interest due to the release of The Art of John Alvin book. Order your copy of the book here. Now is the perfect time to begin or expand your collection of John Alvin's work before everyone else takes the art you want! John Alvin, who became a close friend of ours, is one of the most prolific and well known of all the cinema artists in history. 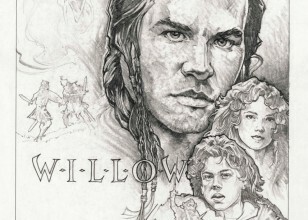 We are honored to represent the original art of John Alvin, and hope his true fans, new fans, or those who know his very important place in film history will be the ones who will get these incredible originals. The new book The Art of John Alvin by his wife Andrea Alvin released by Titan Books is, we hope, the first of several books that will show his importance to the history of film.